As you prepare to send your kids back to school remember that helping to support their education is as easy as checking items off your back to school shopping list! From Aug. 15-28, stop by your local Target® and receive double Bonus Box Tops instantly when you buy 5 or more participating General Mills, Avery, Hefty, Juicy Juice and Welch’s Box Tops for Education® products and earn more for the participating school of your choice. With so many products to choose from, your family’s favorites are sure to be on the list! Visit GrocerySavvy.com for more details and great back to school savings offers. This is such a fun box of goodies ~ really useful too. On top of that, full of box tops to kick off the school year right. Plus a $25 Target gift card so that you can shop for double bonus box top products. Fun huh? 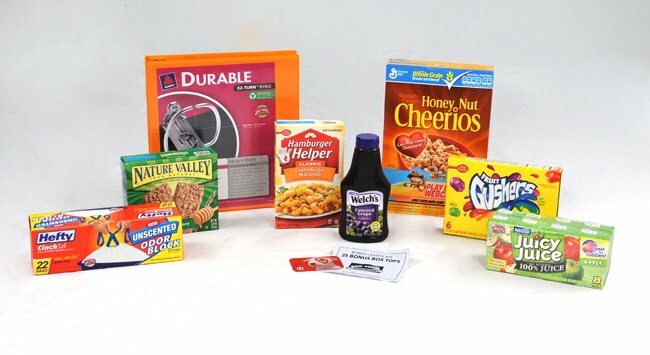 One lucky winner will receive a prize pack that includes- an Avery Binder, Betty Crocker Fruit Gushers Variety Pack, Hamburger Helper Cheeseburger Macaroni, Hefty CinchSak Trash Bags, Honey Nut Cheerios, Juicy Juice 8-Pack Juice Boxes (flavors may vary), Nature Valley Crunchy Granola Bars, Welch’s Concord Grape Jelly, as well as 25 Bonus Box Tops and a $25 Target® gift card to use to purchase your favorite participating Box Tops items. Tell me some Box Tops items you purchase with a Target gift card & become a friend at Wishing Penny via Google Friend Connect :) Both parts mandatory to win - thanks. *Follow me @ jamaise at Twitter & Tweet this : RT @jamaise #GIVEAWAY #WIN a Target Box Tops for Education~ Prize Pack & $25 Target gift card ~ http://bit.ly/a8Z1Ps Ends 9/2 #myblogspark tweet each day for one entry each ! Disclaimer: Gift card, information, and giveaway were all given to me from General Mills through MyBlogSpark to review, and I was under no obligation to review it if I so chose. Nor was I under any obligation to write a positive review or sponsor a product giveaway in return for the free product. These views are my own. I would purchase Cheerios & Nature Valley Granola Bars. I entered your Milly the Pinkest Kitten giveaway. I entered your Rattles CD giveaway. I entered your Real Housewives Prize Pack giveaway. GFC follower. I'd like to stock up on Cheerios and Nature Valley granola bars as kids love these. I'm a follower. I would ger Cheerios and Ziploc bags. Following via GFC (Ten Talents), and I would get Nature Valley Granola Bars (Sweet n' Salty) and probably fruit snacks and cheerios! GFC follower. I'd stock up on breakfast cereals/snacks -Honey Nut Cheerios and Regular Cheerios, Nature Valley Granola Bars. Thanks! I am a follow friend! I would buy cereal...my kids eat me out of house and home when it comes to cereal! I would purchase cereals - I love Honey Nut Cheerios! With a Target gift card, I'd purchase Kleenex (which I think is still on the 'box tops' list), Cheerios, and Juicy Juice. I follow on Google Friend Connect, too. I'm subscribed to the Wishing Penny via email. I entered the George Foreman Grill giveaway. I entered the Pinkest Kitten giveaway. I would purchase Honey Nut Cheerios and nature Valley Granola Bars- Oats N' Honey! I entered the Rattles CD Giveaway! I'd buy some cheerios and some green giant veggies.